The previous seasons of disappointment hadn’t deterred the bookmakers and Diamonds were again rated favourites to secure the one promotion place to the Football League in 2000/01. This favourite status was reinforced by signings such as those of Justin Jackson, Duane Darby and Tarkan Mustafa to fit into a side that already included the likes of Paul Underwood, Ray Warburton, Mark Peters, Garry Butterworth and Jon Brady. The game at home to Woking on 3rd April 2001 was the 500th in the Diamonds History – see here for a reflection on that milestone. 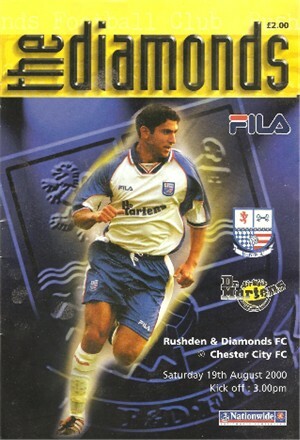 The Diamonds team line-ups for senior games in 2000/01 can be seen here, with a summary of players used in league games here.